A few typographical points: making your manuscript more readable and saving paper to boot! While I am on the subject of working with MS Word I figure I should make a few small (but crucial) points about typography. The first thing you need to know about fonts is that there are two basic types: serif and sans serif. Serif type has those little squiggly things at the tips of the lines that form the letters. Sans serif type has basic, clean lines. One of the most popular fonts for academic work is Times New Roman (or Times); the second most popular are Helvetica and Arial, which are very similar sans serif fonts. As you can see, Helvetica and Arial look quite similar — but notice that Arial takes up slightly less space, while Times New Roman takes up the least space of all. Imagine the difference that will make when you go to print several dozen or more pages—imagine how many trees can be saved when students choose the right font for printed papers! Not to mention how much money you save on copying costs or even printing your own. Although the ink cost is pretty close to the same, you would be saving the cost of paper, and over time that really adds up. 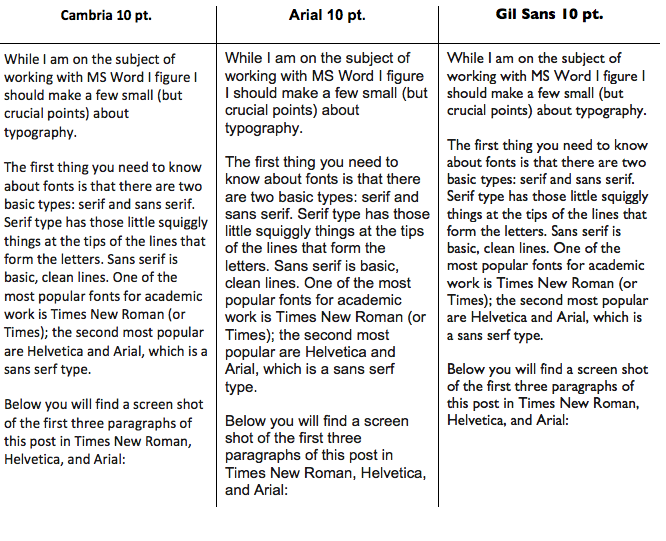 As you can see here, Arial 10 point takes up even less space than Times New Roman 12 pt. But it is still relatively easy to read, even on paper. In fact, both Helvetica and Arial are easier to read at 10 point vs. 12 point type—unless you are in need of large type because of visual acuity problems, the smaller font is easier to read. There comes a point with font size when the larger is more difficult to read than the smaller, especially when there are large blocks of continuous type as there are in academic papers. Headings and subheadings are a different story altogether, however. You need to check with your department’s preferred style book to find out how best to set those headings. Now, here’s the thing. When you are submitting a manuscript to me for editing, I want all of your type to be exactly the same throughout (except where you need to indicate emphasis with italics). Why? Because I will use Word’s wonderful style setting features, which allow me to format your work exactly according to your department or graduate college’s specifications. And if there turns out to be some error, I can change every heading and subheading throughout the paper in the blink of an eye by just changing the style settings. This saves a tremendous amount of work! Equally important is that those style-set headings and subheadings will be used to “magically” construct a table of contents, also in the blink of an eye, with all the page numbers exactly what they are supposed to be and where they are supposed to be. Amazing, huh? Now,when you are submitting a paper on paper to a professor or teacher, first make sure if he or she has a preference for specific fonts and sizes. If you have a choice, you have to weigh the advantages of saving paper versus readability. Saving paper matters most when you have to provide several copies of a long document—you can literally save yourself hundreds of dollars if you have to supply, for instance, five copies of a 40-50,000 word document, which is what most dissertations or books are. Most people can handle 10 point Arial or Helvetica, but some cannot. 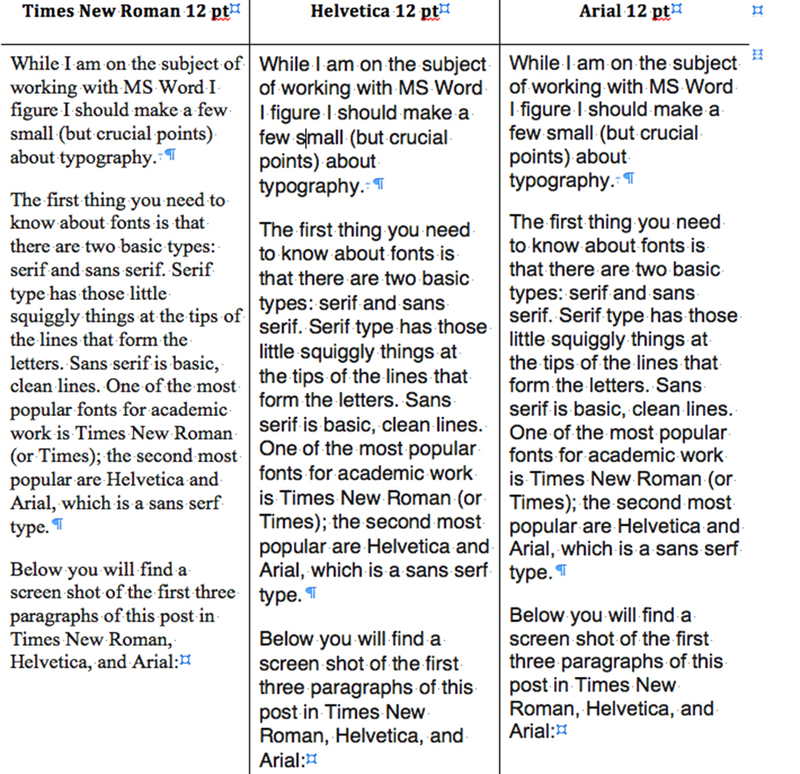 In fact, your professor may specify which font you are to use. There is a reason for this visual “rigidity”—too much font variation among student papers can be distracting. You want your professor to focus on the content of your paper and not on its visual appearance—unless, of course, there is an assignment asking you to use photographs or illustrations and laying the type and images out as a brochure or poster. Whatever you do, don’t vary the font WITHIN your paper (except for size and bolding or italics, as specified for headings and subheadings by your required style book (APA, MLA/Turabian, Chicago, etc.). When you submit a manuscript for publication to a journal or book publisher, be sure to find out what type font(s) and sizes they prefer as well as which style manual they use. Some don’t care about the fonts, but most do. Again, the uniformity of appearance is intended to remove the distraction of having to read submissions in a wide variety of fonts. 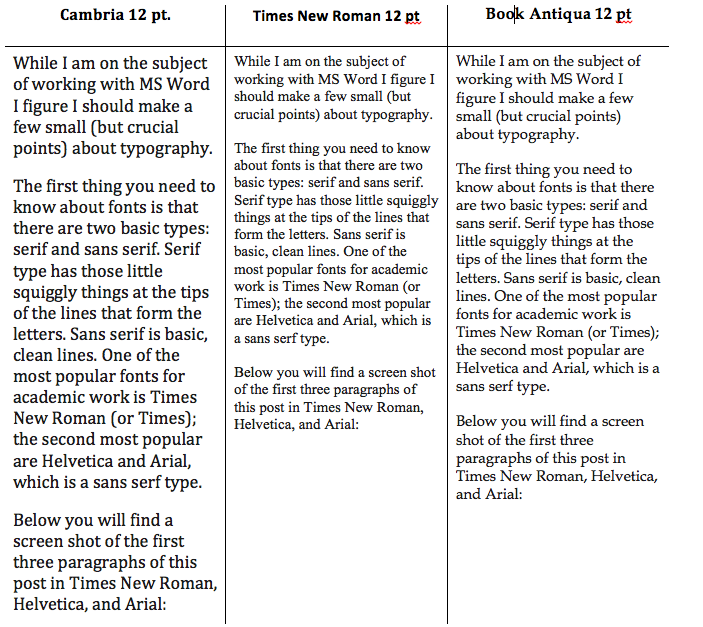 As you can see, Times New Roman beats both of these others hands down for space saving. And although this screen shot of Times New Roman isn’t the most readable (for one thing, remember, serif type is harder to read online), it is eminently readable on paper and the size is just fine. There are typographical terms that explain the differences in appearance and use of space, but unless you are a graphic designer, you don’t need to be confused by them. As you can see, Gil Sans is the most economical in terms of space saving of all these sans serif fonts. However, I don’t recommend it for long blocks of type, such as what you would have in an academic paper. I use it mostly for cover letters (or other formal letters) because I can squeeze a whole lot of words onto one (or two) pages, and it is still relatively easy to read. It wouldn’t work well with 8-10 pages or more, however. 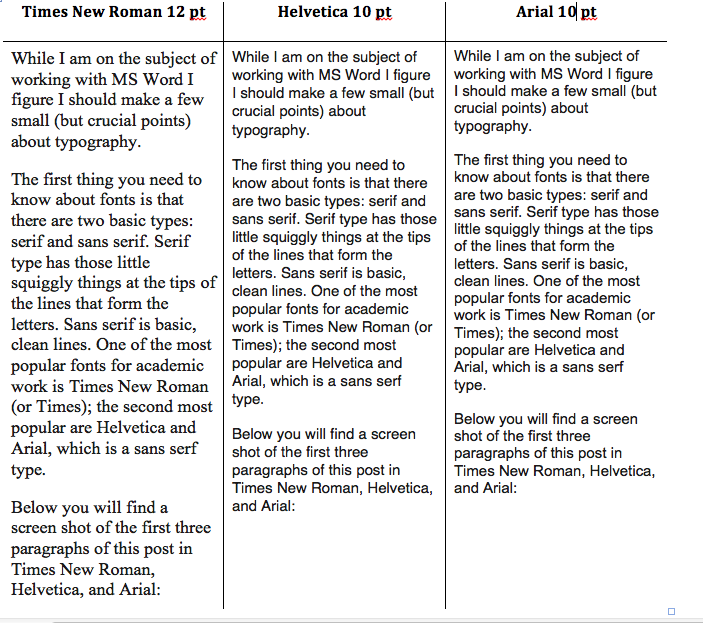 Font and font size selection in academia come down to first pleasing your professor, and second, saving money (not to mention trees) by choosing the font that is both easily readable and economical in paper consumption. Next up will be more discussion of typographical issues. For now, this is enough to absorb! This entry was posted in Surviving Academia, Writing the Dissertation and tagged academic editing, dissertation, MS Word, surviving academia on October 12, 2014 by matrixedit. Check out Thumbtack.com, a directory to service providers in practically any field imaginable. Also a great source for finding clientele. OTSD — Ongoing Traumatic Stress Disorder — a diagnosis for what ails us.